Our backyard is trashy. Most of the time I don’t notice it, but every once in a while I’ll look at it and realize how bad it actually looks! It’s especially bad right now as our lawn mower is still broken (argh) so we haven’t mowed the weeds at all. Our next door neighbors moved out and the house is up for sale. 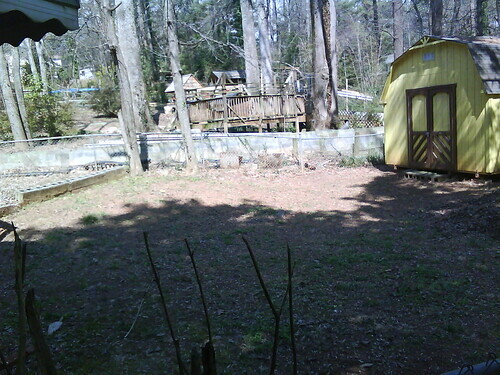 As a refresher, our backyard is kinda at a weird angle and our house overlooks their backyard. You can see a layout here. We have a chain-link fence that (mostly) follows our property line, and they have a cinder block wall just a few feet away from our fence. 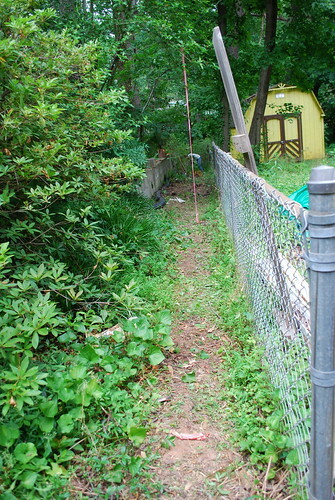 The land between is technically on their property, and was completely overgrown. 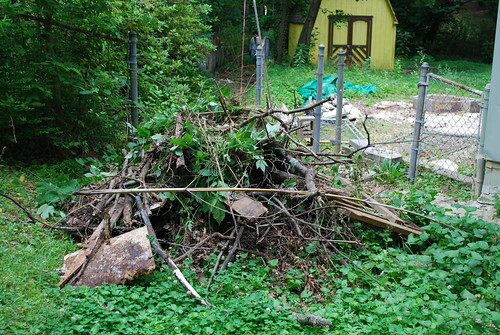 When the landscapers came to look at our backyard, they said that all that underbrush was contributing to our mosquito problem. 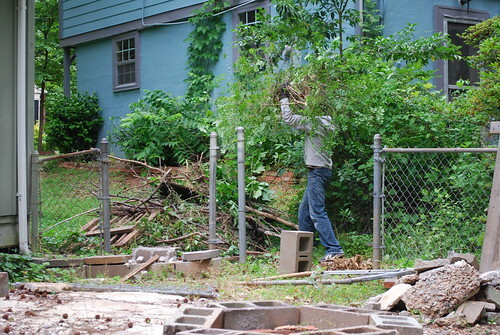 When we found out that the house next door was empty, we realized that here was our chance to clean up the space that was technically on their land. Paul has been working hard this weekend to clean it up! Can you believe Paul cleared out this much already? It’s worth it, though! It’s really looking good! 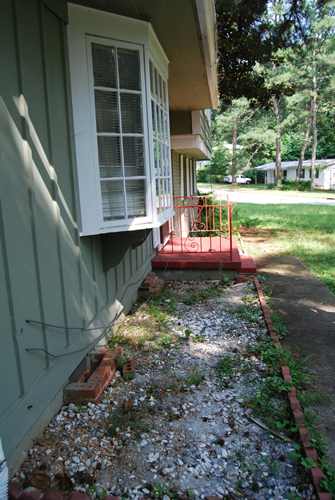 Also, if you notice in the first picture, there is black piping that runs from the neighbor’s gutters, goes underground, and comes out here. The water has been diverting straight into our backyard. Yay. 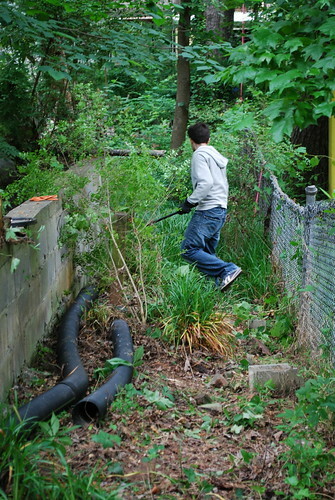 Once Paul cleared out the underbrush, he was able to straighten the pipe out and send the water to the creek in the back. He didn’t get the entire area cleaned up, but he got a significant portion – enough to hopefully make a difference in the mosquitoes. If nothing else, it looks better! Here is what the area looks like now. 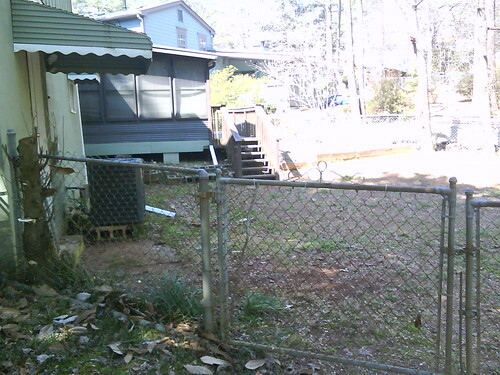 As you see, the fence posts are still up but the chain link is down. 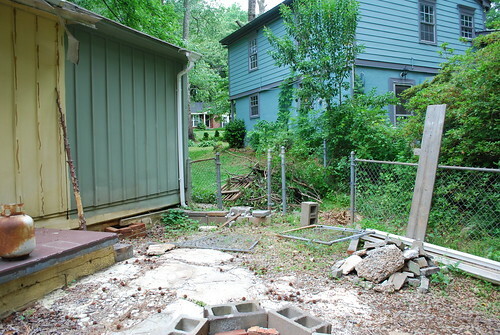 We’re hoping that the landscapers will be able to remove the fenceposts. If I remember correctly, that was something that they built into the original estimate (all the landscapers are running together – can’t remember which ones said they would do that). clean-up, part 2 – pictures! I wrote about how we cleaned up our yard about a month ago here. 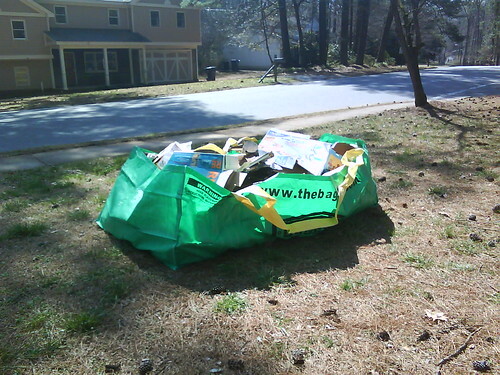 We couldn’t pile it higher than the sides of the bag, or we would have put a LOT more stuff inside. :-) It’s good to get rid of everything we did, though! It really made a world of difference in our yard. It’s finally warming up here in Atlanta, it seems! I am so glad! I hope the warm weather is here to stay. I have been itching to get outdoors! On Saturday, we helped some friends move. Paul switched his work schedule so he’d get Saturday off (and work Sunday instead). I was glad that we were able to both be there, because we were the only ones who showed up to help! One by one, all the other people had things come up and weren’t able to make it. Our friends were totally cool about it though – I would have been freaking out! 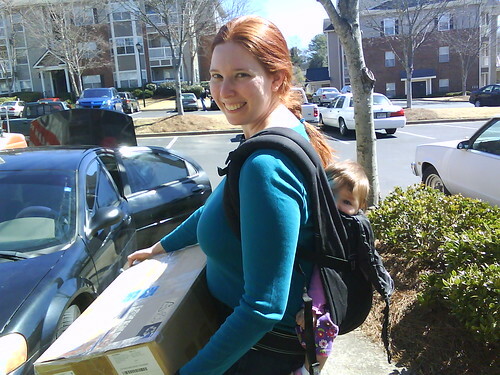 Paul and Doug loaded the truck with all the furniture, and I put Savannah on my back and helped Christine load the smaller boxes. We stopped for pizza after loading, and then our friends decided to call some movers to help unload, especially because they were moving to an apartment on the second floor. So, we got there and watched the movers easily unload the truck in half the time! Paul said he was glad that he didn’t have to unload too because his muscles had about reached their end. When we got home on Saturday, we found a citation on our door for the trash in our carport and yard. When the previous owners moved out, they left a ton of junk that we didn’t know what to do with, so we piled it up where we could. Then we added our own trash. After 6 months, it had gotten looking bad so I don’t blame them for citing us. They gave us until the 9th (today) to clean it all up. Shortly after we bought the house, the wind pulled the storm door in our back door off its hinges and smashed it to the ground. A million pieces of glass went everywhere. I had to pick up all that glass! Our county has a low-flow water law, so we had to replace one of the toilets when we bought the house. The other toilet has been sitting in our backyard since then. I thought about try to give it away on Craigslist, but I’m glad I didn’t try because when we moved it yesterday we discovered that the back had cracked and broken. Miscellaneous trash and debris we found in the backyard, most of it garden related. There were tons of empty plastic bags of potting soil, plastic cups from seeds, and broken plastic plant pots strewn around. Also random things like one piece of a rusty bedframe, cable, a few pieces of chain link, etc. We worked for 4 hours yesterday. At one point, a friend watched Savannah so we both could focus on the yard. After filling the bagster, I raked the entire backyard. It needed it! It looks 1000 times better. As we were working in the yard, we kept coming up with ideas of things we wanted to do. 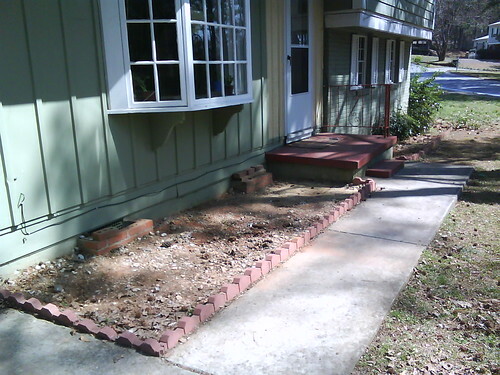 It’s going to be a lot of work to get it just looking nice (and I’m not talking landscaping!). There are tons of branches and of course all the leaves and pine straw, not to mention pinecones and whatever the pinecone equivalent that comes from a magnolia tree. 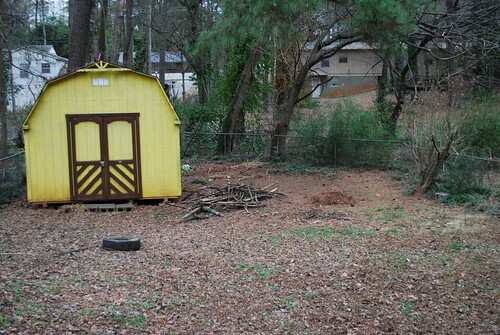 Oh and the more time I spend in the yard the more I really want to move the shed out of the backyard. :-) It really takes so much room! But I can’t for the life of me figure out how we’d get it out of there without a LOT of work. We cleared all the stuff that the citation asked us to, and we called and scheduled a pickup of the Bagster. We didn’t get all the junk cleared out, though. 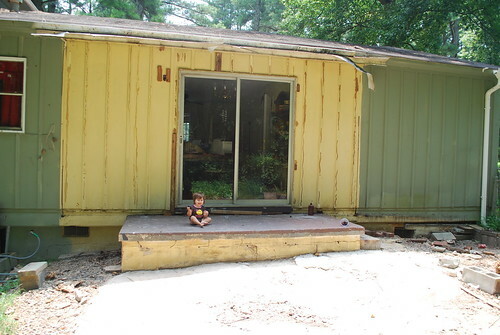 Our sunporch is still full of stuff that we need to get rid of – namely, carpet. We aren’t quite sure what to do about that at this point. One option is to try and fit it all on my sister’s truck when she’s visiting next week, and take it to the local dump. I’d really like to get it out of here! Now that the weather is nicer, it would be great to use the sunporch.